"In simple, easy-to-understand terms, many varieties of sea turtles are described (e.g., hawksbill, loggerhead, green sea turtle, Australian flatback, leatherback) in the book by Gail Gibbons (Holiday, 1998). The text is not intimidating for beginning readers. For visual learners, Gibbons' illustrations are large, clearly identified, and an artistic delight. The accompanying tape offers an added dimension of reading-along. The narrator's delivery is expressive at a pace suitable for emergent readers. 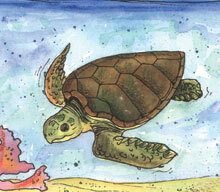 A valuable feature is a two-page spread identifying the differences between a sea turtle and a turtle. Young children will learn a great deal about turtles. Reluctant readers will benefit from the oral component. Proper pronunciation and expression will help to facilitate comprehension and the reading process. School librarians and teachers will welcome this valuable and effective program to enhance their science collection, nature studies, and environmental concern."